...... - TRY IT FREE! - Convert any DVD to Apple TV format. - Subtitle Selection. English Subtitle, French Subtitle etc. - Audio Track Selection. English Audio, French Audio etc. - Various Video crop modes. 16:9, 4:3, full screen etc. - Various Video resize mode. Keep aspect ratio, stretch to fit screen etc. - Split output Video by DVD chapters, and titles. - Fully supports MTV DVDs and Episodic DVDs. - Customize output Video file size and Video quality. - Flexible output profiles. Easily customize Video properties. - Supports DVD to MP3 Audio conversion. - Supports Dolby, DTS Surround Sound Audio. 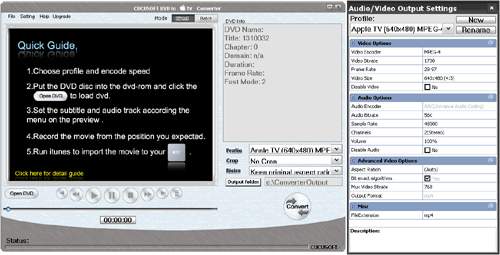 Convert DVD to Apple TV Video MPEG-4, H.264. Put DVD on Apple TV with super fast speed and perfect quality! The best DVD conversion software for Apple TV video (MP4,H264) conversion. Qweas is providing links to Cucusoft DVD to Apple TV Converter 7.19 as a courtesy, and makes no representations regarding Cucusoft DVD to Apple TV Converter or any other applications or any information related thereto. Any questions, complaints or claims regarding this application Cucusoft DVD to Apple TV Converter 7.19 must be directed to the appropriate software vendor. You may click the publisher link of Cucusoft DVD to Apple TV Converter on the top of this page to get more details about the vendor.